Emblem of Katibat Jalamid Urman, featuring the group's name on top as well as the appended name Dir' al-Jabal on the bottom. In the middle is the star that represents the Druze faith. The rim of the emblem consists of the Syrian flag. 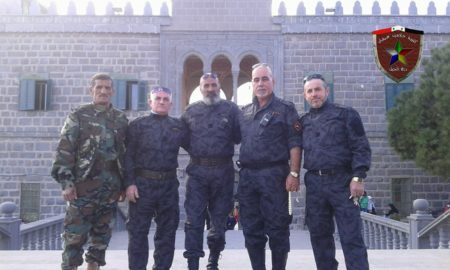 Previous posts on regime loyalist factions in the predominantly Druze province of Suwayda' have primarily looked at groups existing on the wider provincial level, such as Kata'ib Humat al-Diyar of Nazih Jerbo' and the Dir' al-Watan grouping led by Syrian army officer veteran Nayef al-Aqil and Yusuf Jerbo', who is one of the mashayakh al-'aql of Syrian Druze. In contrast, the Katibat Jalamid Urman is a more local outfit. The group's name translates to "The Rocks of Urman Battalion." Urman is a village in southern Suwayda' province located to the northeast of the town of Salkhad. 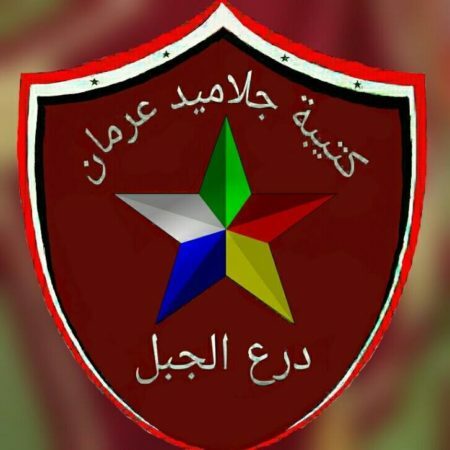 The group's appended name Dir' al-Jabal means "The Mountain Shield," referring to the Suwayda' area that is also called Jabal al-Arab/al-Druze ("Mountain of the Arabs/Druze"). Like the other Druze militia factions in the province, Katibat Jalamid Urman frames its activities in defensive terms. In the About section on its Facebook page, the militia describes itself as "an auxiliary organization for the Syrian Arab Army whose task is to defend the land and honour and protect the dignity of the mountain under the banner of the homeland." The term 'auxiliary' (Arabic radif) is a common term among pro-regime militias. The pro-regime orientation also becomes apparent in other social media posts, such as tributes offered to regime forces personnel injured on fronts outside of Suwayda' like East Ghouta in the Damascus area and the Sha'er field in the Homs desert. 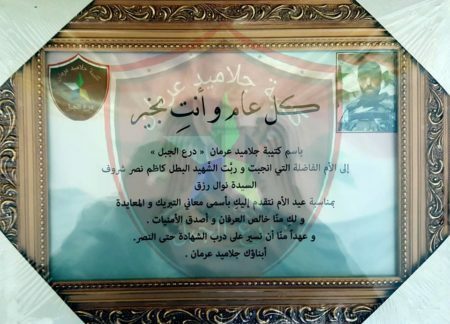 The latter case involved a certain Lu'ay Ghalib Rashid (originally from Urman), who was injured alongside a number of other Suwayda' National Defence Forces personnel in fighting in the Sha'er area in late November 2016. 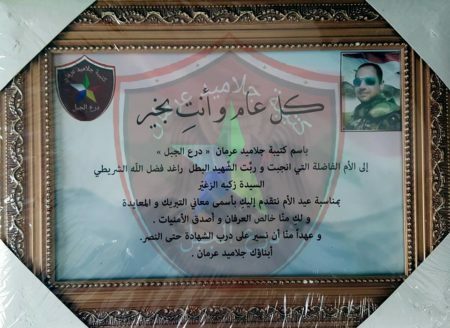 Besides tributes to wounded fighters, Katibat Jalamid Urman also offered condolences on the death of Osama Akram Hamza, a soldier originally from Urman and killed on the Deir az-Zor front in eastern Syria in June 2016. 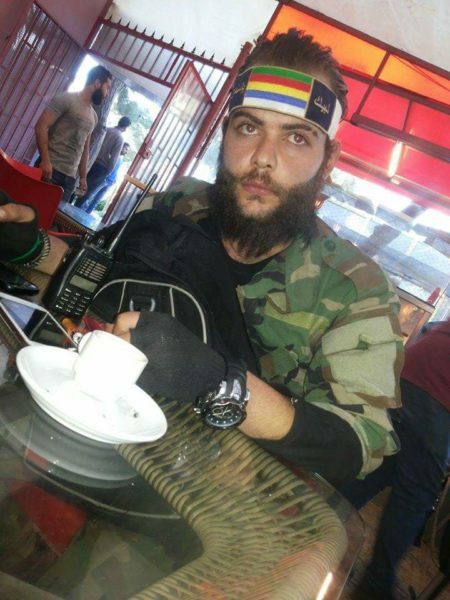 Madin Mahmoud al-Dbaisi, originally from Urman and killed in Darayya on 21 February 2016. Katibat Jalamid Urman has offered condolences for his death too. "Armed battalions have been formed in every village of the villages of the province to be prepared for whatever danger may arise. As an example, in Urman came the formation of "Katibat Jalamid Urman- Dir' al-Jabal," which was formed four years ago both in a secret and organized form and operates on the ground with all determination and willpower. They [the battalions] must be a true nucleus for future projects that the many can rely upon. And here comes the role of our dear exiled ones in supporting the popular activism and charity associations that have begun earnest work in their role, with the formation of special committees and intense connection and the exertion of all efforts to make available the goods of necessity and the necessary foundation for the citizen's daily life as well as provision of security and guarantee for the citizen." To be sure, public references to Katibat Jalamid Urman by name only seem to date as far back as 2015. Yet it does not follow from such an observation that the group did not exist before 2015. Rather, going by the Urman Bint al-Jabal account, the militia simply existed in a more low-key form. The village of Dhibin requests no visit from the one who has called himself the sheikh of karama [Bal'ous] and rejects the theatrics of gifts (portion of arms). The village of al-Gharayya is a blazing fire on account of the error in using the name of our sayyid Sheikh Abd al-Wahhab [see here for this sheikh and the village of al-Gharayya] for lack of respect [of him] and his heirs and inserting his name for interests. And after that, Salkhad al-Zaghaba [al-Zaghaba is an epithet frequently attached to Salkhad] warns against a visit and is actually threatening kill him. And after that, [there is] Urman, which formed the Jalamid Urman faction with support from its noble exiles, and they said if one of the families of Suwayda' hands over the banner to the sheikh of karama, all of the sheikhs of Urman are karama and no one bears the banner of Urman except is people." Bal'ous appears in video footage showing that he did visit Urman as part of his outreach. While there does not appear to be a formal Rijal al-Karama contingent in the village, there does seem to be some sympathy in Urman for the movement's aims, such as a statement issued by "Rijal Urman al-Karama" in November 2015 rejecting forced military conscription at the hands of the security apparatus. "To reduce and avoid the problems caused by some of the youth after the students go out from secondary school, Katibat Jalamid Urman has decided to take responsibility for the situation, and a number of its members have gone out when the students come out and have closed all the entries and have ensured the students' safety until they arrive at their homes." 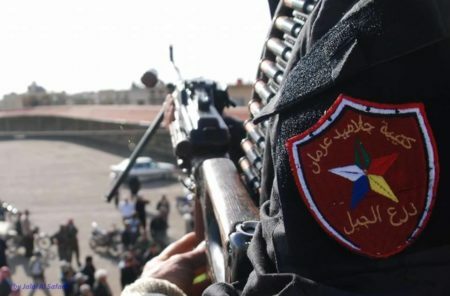 The militia has also engaged in patrols of Suwayda' border areas alongside other groups both on the eastern border areas and on the southern Syria-Jordan border areas, as part of ensuring readiness to respond to any emergency. Besides all these activities relating to maintaining security and upholding law-and-order, the group has undertaken some social outreach, notably replanting trees in the village of Tell Abid Mar, where many trees had been cut down amid the circumstances of the civil war environment. 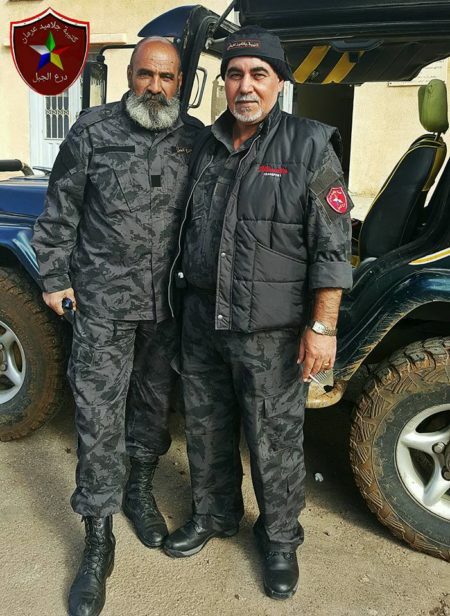 On left, note the Dir' al-Jabal insignia patch on the chest. On right, note the arm-patch identical to Katibat Jalamid Urman's emblem. Similar use of insignia as above, with Dir' al-Jabal chest-patches and the group's emblem in the form of an arm-patch. Closer view of the arm-patch. The existence of the group's symbols on the ground is also attested in certificates issued for Mother's Day for mothers of 'martyrs' who have died fighting for the regime. This honouring of mothers of 'martyrs' was done as a joint event with the Kata'ib al-Ba'ath and two notables called Ghassan Amro and Osama al-Abbas. Certificate issued by Katibat Jalamid Urman for the mother of Kadhim Nasr Sharuf. Originally from Urman, he was killed in Yabrud in March 2014. The current level of security threats posed to the locality of Urman is very low, but the case of Katibat Jalamid Urman does provide an interesting look at militia mobilization and regime loyalist sentiment on the more local level in Suwayda' province. No militia mobilization is occurring within the province at the local or province-wide level that envisions overthrowing the regime structure in place. (Update 5 January 2017): Tayseer al-Halabi of Katibat Jalamid Urman wrote to me today with the following account: "The Jalamid Urman faction was established from the first of the events of our land [i.e. beginning of the Syrian civil war] in the village of Urman. Its aim is to protect the land and honour under the banner of the flag of the Syrian Arab Republic." On the question of the group's independence, he said: "At the present time [it is] independent but at the same time reinforcing the National Defence [Forces] on request. And we distribute aid to the homes of those in need without recompense." That said, he also made clear that the militia gets its arms from the 'dawla' [Syrian state: i.e. the regime], which also translates to some kind of affiliation rather than being completely independent. Thus, the Popular Committees framework seems to match the profile of this group well.